The Ages & Stages series continued: Travel with a Baby 3 Months to 6 Months. Baby’s first camping trip at Big Sur, CA — A bouncinette (or bouncy seat) with zip-close mesh canopy was very helpful when we needed hands free to set up camp–and helped keep evening mosquitoes at bay. Your baby is in his prime for riding—and napping—contentedly on laps and in an infant carrier or sling, while sharing early smiles, all making travel together a true delight. 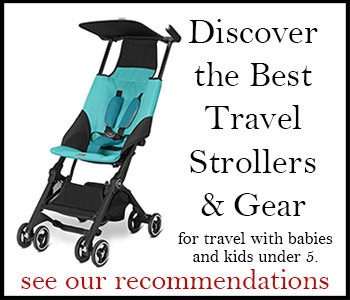 He takes a new interest in his surroundings, and enjoys seeing the sights from the comfort of your sling or “frontpack” child carrier—where he still has the comfort of staying close to the people he knows best (click here to see recommended slings and child carriers for travel). If you haven’t read it already, find courage in Ten Reasons Traveling with an Infant May Be Easier Than You Think, and here are more tips specifically for travel in the 3- to 6-month window. You are still relatively free to choose a destination and schedule the itinerary to suit your adult selves, but because your child’s skin is still very thin and sensitive, sunscreen and repellents are not recommended. See Eleven DEET-free Ways to Help Prevent Mosquito Bites, and for more read Having Fun in [Spite of] the Sun, pg. 145, and Managing Mosquitoes, pg. 148, in Travels with Baby: The Ultimate Guide…. Consequently, you may lean toward destinations where extreme sun and biting insects are not a concern. Urban adventures in cultural capitals may provide the right amount of stimulation for all of you (MOMA for mom, baby swings in Central Park for Junior), balanced with climate-controlled interiors when and where needed. Find family travel tips for specific cities around the world in Destinations. His sleeping arrangements may require more attention through these months as he becomes more active, quite possibly rolling over at some point. A travel bassinet or infant travel bed will give him a comfy place to snooze and play with his toys (see recommended Travel Beds and Sleeping Solutions here), or a portacrib may also be available on request at your hotel or for your cruise ship cabin. Now that he’s becoming more aware of his surroundings, a white noise machine or soundtrack of waves can be extremely helpful in recreating the familiar sounds of sleep from home (more tips for changes in sleeping routines in Nighttime Sleeping in Travels with Baby and its travel companion Take-Along Travels with Baby). Most children in this range do not yet eat solid foods, which helps keep things simple and relatively tidy in transit. In particular, you won’t need a complete clothing change after every meal as you may in the following few months. You can still take advantage of airplane bassinets on long-haul flights with most carriers (see Airlines Table, pg. 244), before your baby is too big and too easily distracted by the noise and traffic around the bulkhead area. For more help, see All About Airplane Bassinets in Travels with Baby and see related features Flying with Infants: Checklist for Getting an Airplane Bassinet and Flying overseas with a baby? Watch out for age, height and/or weight limits when planning to use an airplane bassinet. Often during these months, babies experience a sudden heightened awareness of their surroundings, including other people, which can make it challenging for some to focus on breastfeeding in public places (e.g., airplanes), where they don’t want to miss anything. For this reason, you might want to be sure and book a window seat and possibly avoid bulkhead row seats where there tend to be more distractions with lavatory or galley traffic–or possibly just passers-by who get a better look at your child and want to say hello. For more help, see tips for Nursing on the Go, pg. 97 in Travels with Baby. Using binder clips to attach an extra blanket to the canopy of your stroller can help shield snoozing babies from harsh sun and also minimize distractions during a nap on the go. See more in Five Things You Might Not Think to Pack for Travel with a Baby. Urban adventures and overseas travel (see Destinations for family travel tips on individual cities around the world and read section starting pg. 42 in Travels with Baby), short cruise vacations (see Five Things You Should Know Before Planning a Cruise with a Baby or Toddler), and car trips (see Travels by Automobile beginning pg. 195). Ask Shelly: Car seat for three days in Scotland?